Please note this is NOT a drop-in service. You must book an appointment using the Consultation Request button below. The Consultation Request form provides the possible times for each type of service. Please note that we will be offering NVivo consults and workshops very soon! Keep an eye on our newsletter for the announcement of the return of these services. Subscribe to our newsletter. For assistance with literature and systematic reviews, research data, etc. contact the liaison librarian for your subject. 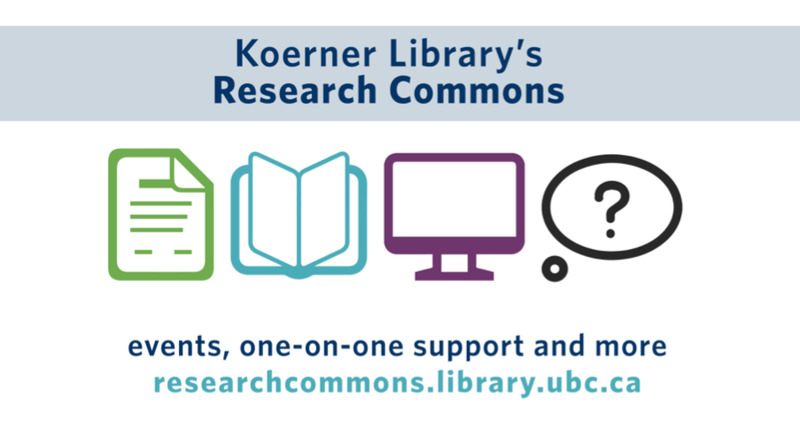 The UBC Research Commons is located within Koerner Library. We offer a welcoming, interdisciplinary, research-driven learning environment for graduate students. The Research Commons offers workshops and one-to-one assistance with citation management tools; two data analysis tools, for both quantitative and qualitative data; and thesis formatting to help students meet UBC’s thesis formatting requirements. Did you attend one of our workshops or have a one-on-one consultation with a member of our team? We'd love to get your feedback!